Ever since Google introduced “The Knowledge Graph” back in 2012, the internet community has struggled to understand what exactly it is and how to effectively use it. The key is to understand why Google decided to add this feature to its search engine. Google introduced this feature as a way to better interpret the often-ambiguous questions people ask of Google and serve up appropriate and useful answers. Once you understand how Google decides what information to present in The Knowledge Graph, you can develop a strategy that is geared toward securing your spot in The Knowledge Graph. In many cases, the search term users type into Google may not be 100% clear in terms of what the user is actually searching for; the search term might be too broad. That’s where The Knowledge Graph kicks in and works its magic. For example, if I want to find upcoming football games for the weekend, I can use the broad search “national football league,” and get the information I want without clicking through to various websites. The answers are all there, in The Knowledge Graph. From this search I have the weekend’s playoff schedule front and center (exactly the answer I wanted). Then, looking to the right side of the screen I can get some facts about the NFL as well as other professional sports leagues in which Google has deduced I may have an interest. 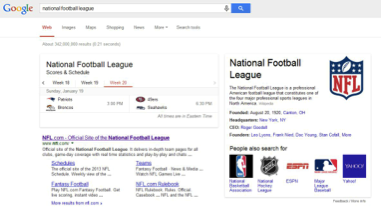 Although your website is likely much smaller and less popular than the NFL, we can still apply this same idea to a local search function and see similar results. If someone wants to find something fun to do in Rochester, NY (my hometown), they’ll most likely Google it. What happens if someone is new in town and he or she queries a very broad search phrase like “Things to do in rochester ny?” Once again, the knowledge graph takes over and displays relevant results that might be of interest to the searcher. Though the searcher might not do a great job articulating his or her question when typing the search phrase into Google, The Knowledge Graph is able to interpret the broad search and answer the question, no matter how ambiguous. The point of these examples is to show how diverse Google’s Knowledge Graph really is. A website owner can use this to his or her advantage by creating content focused on answering questions that people ask of Google. Now for some advice on how you can take advantage of The Knowledge Graph in a few different and very effective ways. First, set up your website with local listings in Google to create visibility for geo-targeted searches like “plumber in rochester” or “pizza place nearby.” When you set this up correctly, they’ll be highly visible in the local search results–more phone calls and more leads are sure to follow, thanks to your efforts. Create content specifically geared to answer the questions that potential customers typically ask. Produce this content and publish it to your website, perhaps as a blog post or research study. Not only are blog posts that answer customer questions well-positioned to be displayed in organic search results, they’re also a great way to get involved in the online community and build authority for their website and their brand name. If, for example, you are trying to position yourself as a top music venue, a great restaurant, or a premier golf course, why not answer the question of “things to do” in their city? Posting onsite content that answers questions is a great way to get included in The Knowledge Graph. Set up Google+ profiles (social profiles) then post and promote content within the social networks. This builds authority for the brand and increases the likelihood that the content will be displayed in The Knowledge Graph. Ambitious business owners will educate themselves on the functionality of The Knowledge Graph and use it to their advantage. Intimately involve yourself and your business within industry communities to find out what questions your customers are actually asking. Once you have a solid understanding of what people want to know/what they are asking, you can build a solid strategy, create outstanding content that provides answers and ultimately, and help secure your place in The Knowledge Graph. Author Bio: Eric Rohrback is a Certified Google AdWords PPC Analyst and the SEO/Local SEO Analyst team leader at HubShout, an online marketing firm and SEO reseller with offices in Rochester, NY and Falls Church, VA.
Nice strategies for local businesses. It is an interesting area to target for high visibility for a relatively low amount of effort. Google plus plays one of the major role in SEO! you explained about Knowledge Graph with detail.